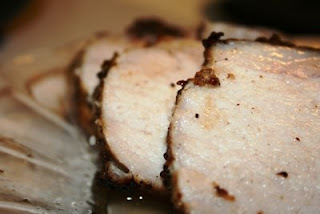 For dinner tonight, I roasted a pork loin. I couldn't believe how well it turned out! The process could not have been any easier. I took it out about half an hour before I wanted to start cooking it, and rubbed it all over with Penzey's Chicago Seasoning. After it sat for 30 minutes, I seared it on all sides in an oven proof skillet in some olive oil and put it in a 375 degree oven until the internal temp reached 145 degrees. I took it out and tented it for 10 minutes while I prepared the rest of the meal. It was juicy and perfectly seasoned...and will make killer sandwiches for school this week!